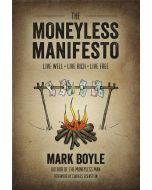 Drawing on inspiration from the natural world, Mark Boyle explores the challenges the world faces – climate change, global poverty, social justice – and how we are to face and overcome them. More than ever, people across the planet want deep and meaningful change. From those campaigning for social justice and ecological sustainability, to those who want to protect animals, indigenous cultures and those in poverty, millions are realising that another world is not only possible, but absolutely essential. Yet despite the creative and determined efforts of so many, our crises deepen. A politico-economic system, increasingly benefiting a small elite, has brought us to the brink of climate catastrophe, ransacking ecosystems and unravelling communities, forcing us into unhealthy ways of life that conflict with our deepest yearnings. The problem may no longer be a lack of will – but a dogmatic adherence to laws and cultural narratives designed to keep things just the way they are.